Back on point: Let the nation take the next regressive step from its status as a once-upon-a-time democracy endowed with the separation of governing powers, and bestow a right upon President Trump which he would wield oh-so flawlessly: The Power of Infallibility. Economist Paul Krugman, who leans so far left he can’t but walk in circles (so I’ve been told), beat me to the punch more than a year ago with his article “America’s Epidemic of Infallibility” but he didn’t give much historical backdrop. Keep reading – it’s your lucky day. The Roman Catholic Church made the “Infallibility of the Pope” official church dogma in 1870. The doctrine doesn’t imply that the pope is perfect or without sin, but that when speaking “in office” – as the authoritative voice of church teaching, with the backing of the college of bishops – he’s spot on, every time. Fast forward to Pope John Paul II in 1994. He seemed to say “infallibly” that women would never be ordained as priests in the Roman Catholic Church. An American Catholic bishop at that time opined that the pope’s statement, of course, in no way diminished the equality or dignity of women. Hmmm . . . more than twenty years later, the all-male college of bishops is still hashing out the “infallibility” of JP II’s decree. Ahem. Back on historical point: 1870 was also the year of Italian reunification – political resurgence and nationalism brought an end to the pope’s temporal rule of the Papal States. Pope Pius IX, as political power slid through his hands like dry sand, cloistered himself behind church walls in Rome and became the self-proclaimed “prisoner of the Vatican” where he remained until his death in 1878. A separation between church and state, non-existent for much of Catholic Church history, took hold. The late nineteenth century was also the age of Darwin, Mendel, and Pasteur. Science was ascendant. Religion’s reign as the sole source and arbiter of “knowledge” – the meaning of the word “science” – was coming to an end. The church, in its attempt to maintain hegemony, reacted to the challenge of science by claiming to have its own incontrovertible facts. “Infallibility of the Pope” for Catholics, and a few decades later, “The Fundamentals” for Protestants (the inerrancy of the Bible, the virgin birth and bodily resurrection of Jesus), were institutional attempts at restoring lost place and power. True believers, id est base supporters, were told these salvos would counter modernity and all of its accompanying evils. It’s in this same spirit that I propose infallibility for the president, so he can shore up power beyond his base (30-35 percent of voters) as modernity continues its barrage upon American greatness. “President Trump”? “King Donald” or “Pope Donaldo” carries much more gravitas and either would be the necessary remedy to make American white great again – like it used to be, before Obama became president, the guy who wasn’t even born here (that’s what Thee Donald said). In today’s America, why should gays be able to marry and order wedding cakes from whomever they please? Why should slacker youngsters and old geezer hippies be able to smoke weed with impunity? Why should blacks and Hispanics expect fair treatment from law enforcement? And why should immigrants and asylum seekers, coming to the country of immigrants, expect even a hearing? This is why we need a real ruler (like Trump said of Kim Jong-un), as if an infallible king, to whom people will actually listen, at attention! – or else!!! Oh, yeah . . . when praising the dictator, Thee Donald said that he was being sarcastic. Thank God for sarcasm. It helps us laugh and cope with incompetency, injustice, and other inadequacies. The president who wants be so much more has showed us, by his own vitriol, the real enemies of the people: immigrants, Muslims, Mexicans, Mexican-Americans, Central Americans, Syrian refugees, journalists, Democrats, the FBI, judges who don’t rule as he wishes, and women – not all women, of course, but some of them. At the same time, he’s made us see the good side of dictators and racists. Putin and the protestors at Charlottesville – who knew they were getting a bad deal? Now we know better . . .
Democratic principles – the aforementioned separation of powers, due process of law, equality – are so overrated. Bullying is the only real way to get things done, punctuated by extended campaign rallies long after the final tally of the election. Pardon power? Immunity? These two are mere beginner steps for Thee Donald. Let’s allow him to take it to the next level – infallibility. Lady Liberty has beckoned for more than a century, but now it’s time to give back – or better said, time to expel. President Trump’s uncharacteristic wishy-washy revocation of DACA, Attorney General Jeff Sessions’s enthusiastic endorsement of the revocation, and the House Republicans’ steady inaction on immigration reform could result in the expulsion of hundreds of thousands of Latino youth (and others). American society, over the centuries, has given slaves, migrants, child laborers, and foreigners the opportunity – that’s right – to build the nation through their blood, sweat, and tears. Yeah, legalized slavery is a thing of the past thanks to the stinkin’ abolition movement and that obstinate president named Lincoln. 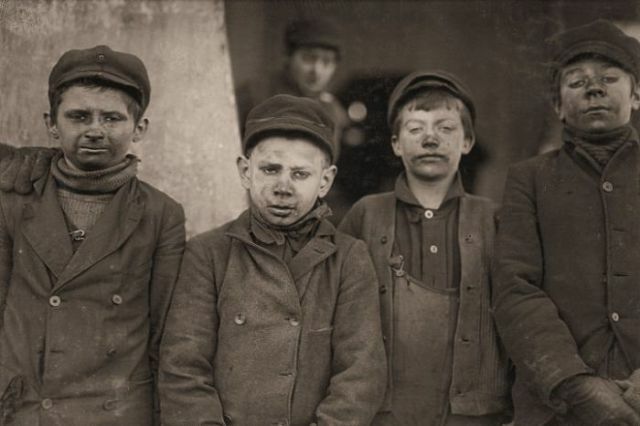 And the days of kids getting their fingers stuck in cotton-spinning looms and coal mine breaker boys getting their lungs full of coal dust are over because of the stinkin’ rise of unions, child reform labor regulations, and compulsory education laws. The problem of all these horrible DACA recipients in the country couldn’t possibly be one of our own doing, could it? Two words: Cheap labor. Five more words: Oh how we love it. Without America’s long-standing love affair with cheap labor, why would the parents of these DACA recipients have come here in the first place to do their unpatriotic duty from the bottom rungs to make America great? Remember the foreign and migrant workers who laid rail track in the western territories and states? Lucky them! Today their vocational descendants pick fruit in the south and west and harvest wheat in the Plains, slaughter pigs and cows in the Midwest, clean up restaurants and office buildings and cut grass and trim trees all over the country. Why give them – and their children – a path to citizenship with legal rights and protections when we can continue to exploit them for what we need so dearly – unprotected and loosely regulated cheap labor? How the hell are my wife and I supposed to enjoy relatively cheap California wine ($10-15) if it becomes more expensive ($25) because some damn Mexican grape-pickers need to be paid a living wage? WTFlagon. If you must know the specifics: DACA – Deferred Action for Childhood Arrivals – was a policy put into place by the Obama administration in 2012, after a do-nothing Congress did nothing on immigration reform. Close to 800,000 applicants have been approved since that time with the majority of these living in California and Texas. And now the great American president has given a green light to AG Sessions to pull the plug on the program. All of these horrendous “Dreamers,” who came to the USA on the backs of their parents – get the hell out! Thank God for the Texas Attorney General (currently indicted for securities fraud) doubling as a fine Christian man, standing up for the US Constitution with a threat to sue the president if DACA is not revoked. The poor, tattered Constitution is under fierce attack from Dreamers who go to school, work, and make their families stronger. Hell, some of them even go to church. It’s so entirely un-American of them – if only they would learn how to smoke weed and binge drink like a lot of white kids from the suburbs do, while cruising around in cars provided by Mommy and Daddy. That’s the American way. A musician in Austin that I’m fond of (James McMurtry) sings, “We can’t help what came before.” These damn Dreamers, if they’re so smart, they should have known to do something about their status before their underachieving parents brought them here. Another American musician I’m fond of (Lou Reed – RIP) sang of the aforementioned Lady Liberty: “Give me your hungry, your tired, your poor and I’ll piss on ’em. That’s what the Statue of Bigotry says.” Reed was a New Yorker. As you can tell by his lyric, he knew, just like the great American president knows, that Lady Liberty was soooo nineteenth century. It’s about time we start living up to the updated credo, championed by the really, really rich president from New York: Put America first, baby. Go home, wherever that is, you damn Dreamers, and quit ruining our – not yours, but our – country. We’ve come a long way from the dark days of the summer of 2013 when fourteen Republican senators joined fifty-four Democratic senators to approve an immigration reform bill. A bipartisan group of eight senators championed the bill, but, thank God, the House Republicans wouldn’t join in the apostasy. The bill died before the president who wasn’t even born here could sign it. The problems America faces are too many to list in a blog post designed to run 750 words. Suffice it to say, getting rid of close to a million Dreamers would set the country back on the path to greatness because expulsion would get at the very root of every single one of the problems – again, too many to mention – that beset us. And hell, once we get rid of all these stinkin’ Dreamers, we’ll feel much better about ourselves as a society. Probably, maybe. Lou Reed was on to something, but for the moment I’m going to call Lady Liberty “The Statue of Irony.” It’s times like these that we need her torch of enlightenment (ironic, isn’t it?) to shine ever so brightly! T. Carlos Anderson is a pastor and writer based in Austin, Texas. 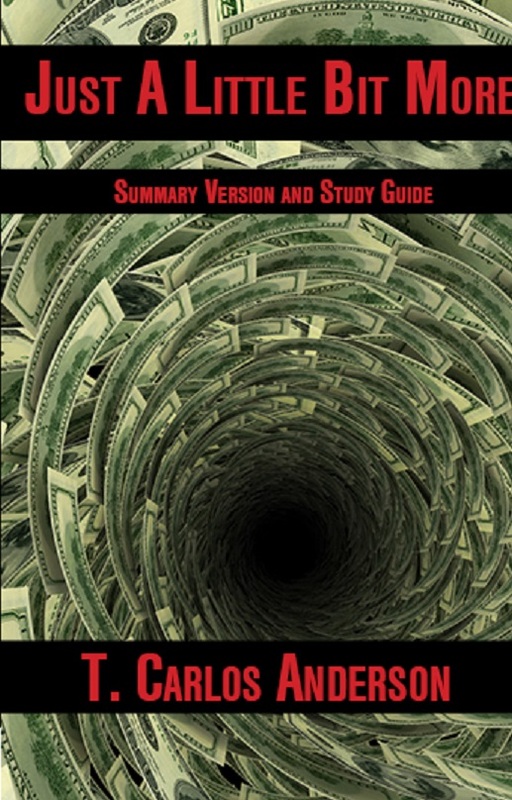 His first book, Just a Little Bit More: The Culture of Excess and the Fate of the Common Good, is distributed by ACTA Publications (Chicago). JaLBM is available on Amazon as a paperback and an e-book. It’s also available on Nook and iBook/iTunes, and at the website of Blue Ocotillo Publishing. Thanks to the Austin American-Statesman for running a condensed version of this blog post in the Saturday, April 1 edition. No foolin’ . . . Some of you know that I’m working on a new writing project, and no longer serving as a full-time parish pastor. That doesn’t mean that I don’t have opportunity to preach on Sundays – I was honored to preach recently at Palm Valley Lutheran in Round Rock, Texas. Solo es que prediqué en Español. I preached in Spanish for the congregation’s Hispanic Ministry effort. Thanks to colleague pastor Joaquín Figueroa for the invitation. Most of the gathered faithful were immigrants, born outside of the United States. They reminded me about el ánimo (explained below) – part of the immigrant spirit, a principal foundation of this society. I used Isaiah 58:1-9 for my message. This post-exilic text – leaders returning to a destroyed Jerusalem to reconstruct the city and its temple around 500 B.C.E. – entreats people to remember that the best religious practice balances worship piety and social concerns. Plain and simple: gathering for worship to sing, pray, and uplift Scripture goes hand-in-hand with the good acts of feeding the hungry, welcoming refugees, and practicing justice in the market place. On the surface, our current societal context in the United States is much different from Israel’s in the 5th century before Christ. The Israelites lacked material resources as they returned to their homeland with hopes and dreams. Here in the United States, material resources abound for many to pursue their hopes and dreams. What the two disparate contexts have in common is anxiety – personal and societal. Israel was anxious about the momentous task of rebuilding their city while having to protect themselves. In the United States, we have levels of personal and societal anxiety that are off the charts. And what do individuals and societies do when they experience high levels of anxiety? They turn inward. Adopting survival-mode is a logical response – and some will argue, a biological one – to anxiety. It’s natural to turn inward and to close ranks; individuals put me first, and societies adopt us and them language and put tribe, ethnic group, or nation first. Be careful, however. Turning inward is a legitimate response for emergency situations; as a long-term strategy, however, turning inward doesn’t make for a better me, you, us, or nation. This was the prophet’s message from two and a half millennia past. Reaching out to the hungry, welcoming the stranger, and treating others fairly in the market place were vital components to the right practice of religion. They still are. After the worship service, we gathered for Estudio Bíblico – Bible study. Pastor Figueroa invited me to present a few themes from my work on faith and inequality from my book Just a Little Bit More, now available in summary form in Spanish as Solo un Poco Más. We had a lively discussion, using Ecclesiastes 5:10 as a guide. We talked about work, money, faith, responsibility, and el ánimo – best translated in English as drive, enthusiasm, effort. The stories shared spoke of sacrifice, perseverance, and dogged hope – and good ol’ hard work. All of the men who were present work in construction; the women work as house and office cleaners, and in healthcare. Almost all send money to relatives in their native countries. These are great American traits and practices – busting one’s tail for extended family, paying taxes, teaching children the value of hard work, and uplifting common good by attitude and lifestyle. This is the immigrant spirit that so many have brought to these shore through the generations and still today. This is the positive spirit of just a little bit more. The negative spirit of just a little bit more has shaped American society as well. Slavery and the near-extermination of indigenous inhabitants were carried out, whether the perpetrators knew it or not, in the spirit of social Darwinist conquest. In that day for many, the end result justified the means used. Today, greedy Wall Street firms and pharmaceutical companies blatantly ripping off customers are only two examples of the pervasive negative spirit of getting what’s mine at the expense of someone else. Today we know that neither the means nor the ends are justified when someone takes advantage of another socially or economically. Drive, enthusiasm, and effort – el ánimo – are great traits when used for the betterment of family, community, and society. Life is complicated; efforts at betterment, small or large, must be examined continually to make sure that others are not taken advantage of in the process. High levels of personal and societal anxiety explain why a lot of Americans voted for nominee Trump. His promise “to put America first” struck a chord. What “America first” means precisely and whether he can carry it out in the globalized twenty-first century remains to be seen. While he doesn’t disdain immigrants or migration generally – First Lady Melania is an immigrant – his specific disdain of people of Mexican heritage, Mexican migrants (whether legal or undocumented), and his attempted ban of Syrian immigration sends a clear message: some immigrants are not to be trusted. No one has or ever will accuse the president of being a historian; his strategy of turning inward goes against the best moments of our history and joins some of the worst (the Trail of Tears in the 1830s; FDR interning Japanese Americans after Pearl Harbor; the flourishing of the Klan in the 1950s; and, the era of McCarthyism). When the president models reactionary behavior concerning immigration, it follows that some ugly bits of our history will be repeated. Take a stand – either from religious conviction or human solidarity – and welcome the stranger in your midst. We have more in common than that which differentiates us. The following story exemplifies the best of the immigrant spirit. I travelled to Detroit with eight of my high school youth two summers ago for a five-day national youth gathering – 30,000 Lutherans descended upon the Motor City. The Detroit Chamber of Commerce slipped up a bit; apparently word didn’t get around that the Lutherans – 30,000 hungry people with money to spend – would be arriving mid-week. Late that Wednesday afternoon of our arrival we walked downtown Detroit with the goals of taking in a few sights and getting some eats. I had checked the Web previously and picked out a place called Gateway Deli (I’m a big sandwich guy, and my youth gave me first dibs on choosing a place to eat). We found the place – 333 W. Fort Street – but it was closed!! The restaurant’s hours were 7am – 4pm. We were so disappointed – and hungry. I looked inside past the “CLOSED” sign to see if someone was inside. A guy came to the door and opened up. He said, sorry, we’re closed. He had an eastern European accent. I explained our dilemma. He said that he heard a big group was coming this weekend, but he had no idea people were arriving today. He said he’d been there that morning since 4:30am. I said your menu looks great – I had perused it online. Then he said the magic words: “Come on in. I’ll take care of you.” He had already put in twelve hours that day. And he did take care of us. One of his wait staff was still there. Between the two of them they served us – a group of ten – with smiles, hospitality, and great food. And, yes, we gave our server, a middle-aged white woman who had to moved to Detroit from Arkansas, a hefty tip. As the youth finished their meals, I went over and talked to the kind man who let us in after they had closed. He said call him “Q.” He was the proprietor. Yes, he was an immigrant from eastern Europe; I didn’t ask which country. He had previously lived and worked in New York City, and then moved to Detroit in 2013. He heard that rents were cheaper in Detroit, and that the city was making a comeback from the turmoil of the 2008-09 economic crash. And he was right – Detroit is coming back, thanks to immigrants like Q and other hard-working Detroiters. Three days later we came back and had a great breakfast. That weekend he stayed open later for dinner and had staff to cover. Our second meal at Gateway Deli was just as good as our first, and all of our youth got a kick out of thanking our new immigrant friend who went by the cool name of Q. The immigrant spirit. There’s no America without it. The immigrant spirit reminds us where we’ve come from; it reminds us that this land originally did not belong to us; it helps keep us honest and focused. Spend some time and talk to the next person you encounter who speaks English with an accent. Listen to their story. Their immigrant story just might surprise you – for the better.